Do Support Groups Play a Role in Weight Loss after Laparoscopic Adjustable Gastric Banding? 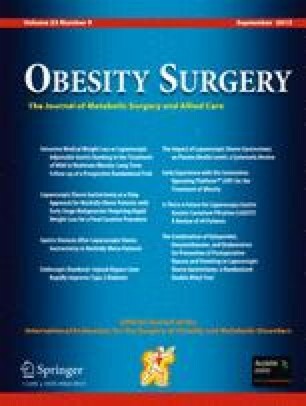 Background: Surgical intervention represents the only treatment with long-term efficacy for morbid obesity. Laparoscopic adjustable gastric banding (LAGB) is a minimally invasive operation that is increasing in popularity. We hypothesized that attending support groups is beneficial to achieve optimal weight loss after LAGB. Methods: 38 patients who underwent LAGB between Dec 2002 and Aug 2003 were studied retrospectively. Patients were divided into 2 groups; A included 28 patients who did not attend the support groups (surgery without support groups), and B included 10 patients who attended the support groups (surgery with support groups). Weight loss between the 2 groups was compared over a 1-year period. Results: Patients who attended support groups achieved more weight loss (mean decrease in BMI = 9.7 ± 1.9) than patients who did not attend support groups (mean decrease in BMI = 8.1 ± 2.1), P = 0.0437 (unpaired t-test). Conclusion: Support groups appear to be an important adjunct for patients who undergo LAGB, to achieve and maintain improved weight loss.